In the blogging world, I'm what you would consider a "free spirit." I use Blogger as my platform, I don't have a site designer (did it mah-self! ), I don't use stock photos, I don't pay for hosting, and I don't have a "niche." I don't do about 90% of the things that the big bloggers recommend doing. Because <stomps foot> I just don't wanna. The first reason I completely ignore most advice is that I still have trouble identifying with blogging. I don't call myself a blogger. Maybe I should. Maybe it's time. I mean, after all, I've certainly been doing this long enough. I also don't don't follow those "90-Thousand Rules to Have a Popular Blog" because so many of them just aren't me. And when I do things that aren't me, I don't have nearly as much fun. I get burnt out, I write poorly, and everyone suffers. There's only one tip from the blogging powers that be that I actually follow. And that's a content calendar. Believe it or not, there is a method to this madness. When I first started blogging on this little corner of the internet, I was... well... random. Not that I'm any less random now, but my posting schedule was random. And now I actually have a schedule. Yes, I'm one of those weirdos. Knowing that I have a post due helps me to actually, you know, write it. My content calendar also helps to define the categories of my writing, so I kind of know what I'm supposed to be writing for a particular day. Generally, my time on the internet for blogging takes place when my hubby has to work late and I can be in my office, or during my lunch hour, or very, very rarely when I come in to my office early. I write most of my posts at home, on a word processor, and then I save them to a flash drive and upload when I have a chance. That doesn't leave much time at all for editing pictures or scheduling social media... so none of my posts are "spur of the moment." I schedule everything. Having a calendar helps me organize all that, so I know when I need to edit a picture, or so I know when a post should be scheduled. If you haven't noticed, I'm what you'd call a "lifestyle blogger." Which means that I write about... everything. But I know that some of my readers come to read my devotional posts- nothing else. Some of my readers want to see my actual, real, weekly life. Some come to see a specific series, like my Featured Farmers. You get the idea. So, to make it a little more "streamlined" for those people looking for specific posts, I generally publish devotions on Mondays, homesteading and farm-y posts on Tuesdays, random miscellaneous posts on Wednesdays, and my weekly Blessings posts on Fridays. Of course, there is a little variety to that, but not a whole lot. I write about three posts a week, regularly. My readers can expect that. 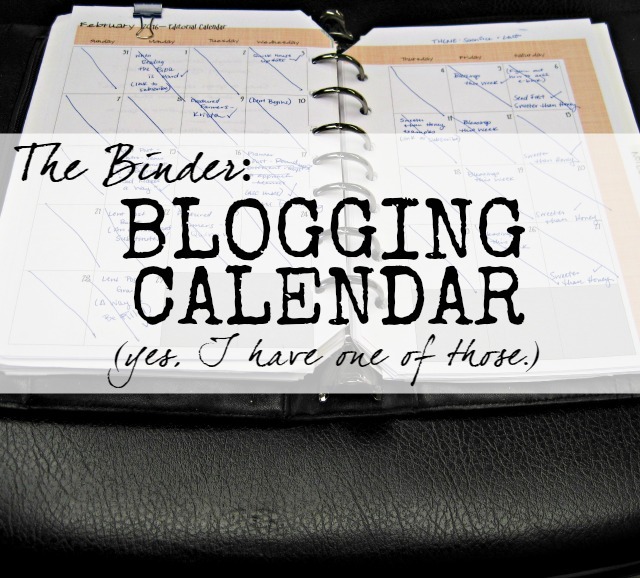 Basically, I print out an extra copy of my monthly calendar and stick it in the 'blogging' section of my binder. I know a lot of people use Google calendars or other high-tech things, but I don't. Because of the no internet at home thing, and the no smart phone thing, and also because writing things down really helps me to remember them. You can download my calendar from this post here-- (it's for half-sized planners). 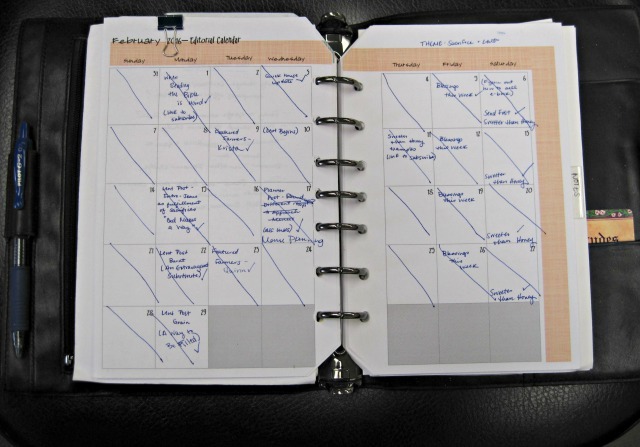 The Ultimate Blog Planner includes lots of good stuff, including a rocking content calendar. Or just go to Etsy and search "blog planner." You'd be amazed. Seriously, though, having a regular schedule for posting on the blog makes me feel a little less... fly-off-the-handle-ish. And a little more like a real live blogger instead of just a random person putting words into the universe.